At Cebit, Deutsche Telekom and SAP are showing how the two have improved logistics in the Hamburg port. In a bid to give the local manufacturing industry a leg up, Deutsche Telekom and SAP have joined forces to create standards for what the Germans have dubbed Industry 4.0. At this year's Cebit trade show, Industry 4.0 is the hottest buzzword. It's an umbrella term for connecting every part of mainly the manufacturing industry, which is an important driver of the German economy. The term is related to the Internet of things, since sensors and machine-to-machine communications are an essential part of industrial connectivity. The concept covers connectivity for everything from development and production processes to logistics, services, and after-sales support. Deutsche Telekom and SAP's goal is to develop de-facto standards as quickly as possible. They also want to bring a more unified German front to international standards organizations, including the Industrial Internet Consortium in the U.S., according to Reiner Missale, senior vice president for cross-industry digitalization at Deutsche Telekom subsidiary T-Systems. Deutsche Telekom and SAP will first sit down and identify where new standards are needed. The goal is to find the gaps while at the same time take advantage of existing standards where possible, Missale said. More work is needed, for example, on standardization of data formats to improve interoperability of machines, sensors, and software. This work will be concluded during the first half of the year, and them the companies will move on from there. T-Systems also talked about some of the projects it has already been involved in. For example, the company has worked with agricultural machine manufacturer CLAAS to connect harvest machines and tractors for more intelligent grain harvesting. The companies have built technology that allows combine harvesters to communicate directly with tractors over a cellular network. To save time they emit a signal when a tank is full and calls a tractor and trailer to come pick up the grain directly at the harvester. 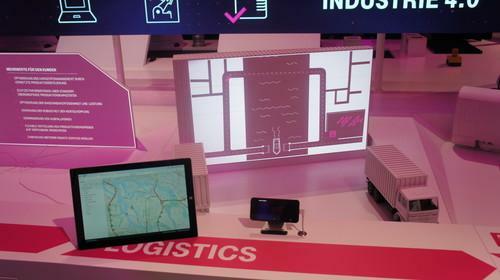 At Cebit, a simulation of the port of Hamburg demonstrates how logistics can be improved. The underlying system, which has also been developed with SAP, aggregates all the traffic and infrastructure data of the 72 square-kilometer port facility in a private cloud. Based on all this information and what the final location is, truck drivers receive specific arrival times and routes directly on their devices to streamline the whole operation. The system has been operational in Hamburg since January. What SAP and DT have learned developing this system can be applied on other large distribution hubs, according to Missale. And this is what's starting to happen in the IoT sector, in general. Step by step, it's becoming more mature, even if it still has a long way to go.